Only 3 more days until Halloween. Can that be right?? Seems like fall is whizzing by faster than I can shake a crunchy, brown-leafed stick at it. I’m starting to panic a little, not because of the impending doom of another Michigan winter, but because I have oodles of fall recipe ideas just simmering in my noggin’ like a hot bowl of curried squash soup. I plan to share more savory recipes and meal ideas in November. I realize it’s been all apple doughnut this, and caramel apple that for the last few weeks. Treats, sweets, and more treats… but no chocolate! Well don’t worry my fellow candy fans, I’ve got you covered. 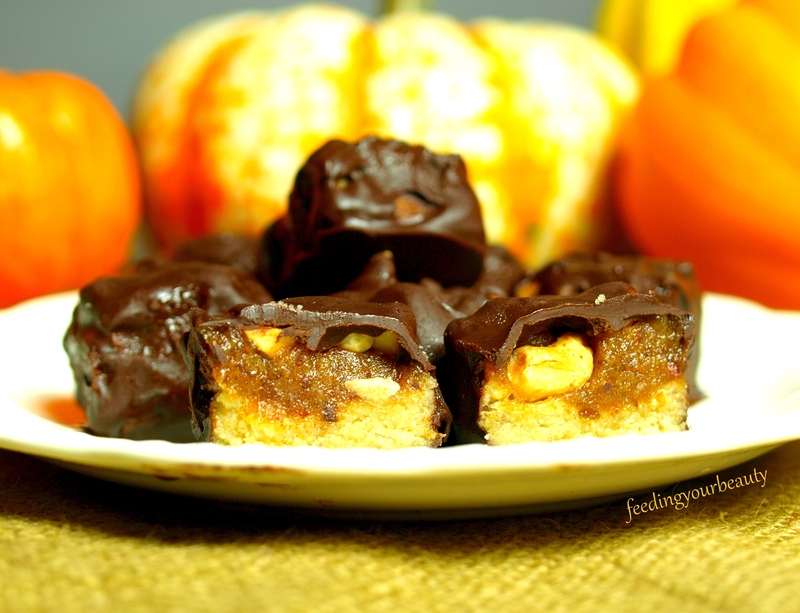 Just in time for Halloween… Dark Chocolate Snickers Minis! Nothing used to satisfy those trick or treat expectations quite like a bite size candy bar, especially the highly coveted Snickers. At least that was my experience. Even as a young adult I ate my fair share of candy bar miniatures. Unfortunately, they are not vegan friendly. Even if they were, those fake tasting, sugar-on-steroids, dripping with high fructose corn syrup, candy bars don’t even taste that good to me anymore. Once I started making my own treats or buying only high quality vegan dark chocolate, the cheap, conventional counterparts are simply not as tasty. After posting my snickers ice cream bites over the summer, I started mentally reworking the recipe for a non-ice cream, classic snickers candy bar. It was the nougat that eluded me. Eventually I came up with an idea, one that incorporates the healthy caramel portion, so that the nougat isn’t this completely separate thing that requires a lot of prep and measuring. 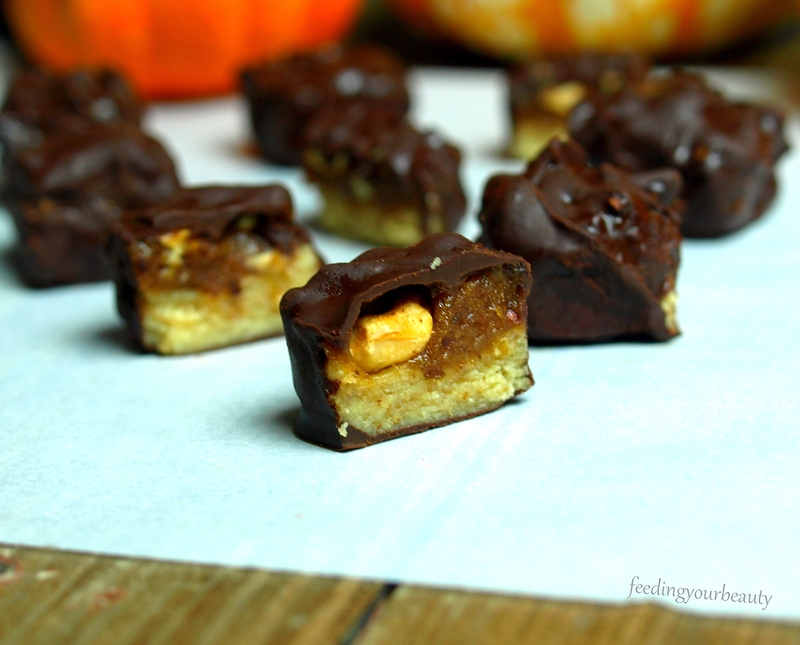 Yes, my friends, these snickers come together surprisingly easy. I’m all about keeping this fun and easy! 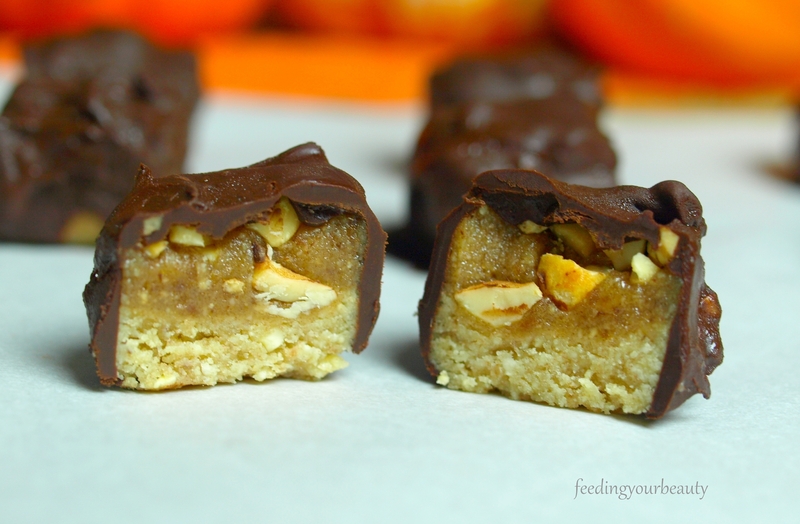 I just want you to get some healthy snickers in your life, pronto. Want to make these treats totally raw? Can do! Simply follow the tips at the end of the recipe. As is, they’re already about 80% raw. Or something like that. I’m not very good at estimating percentages. I can tell you with absolute certainty, however, that these made-over snickers are 100% delicious. 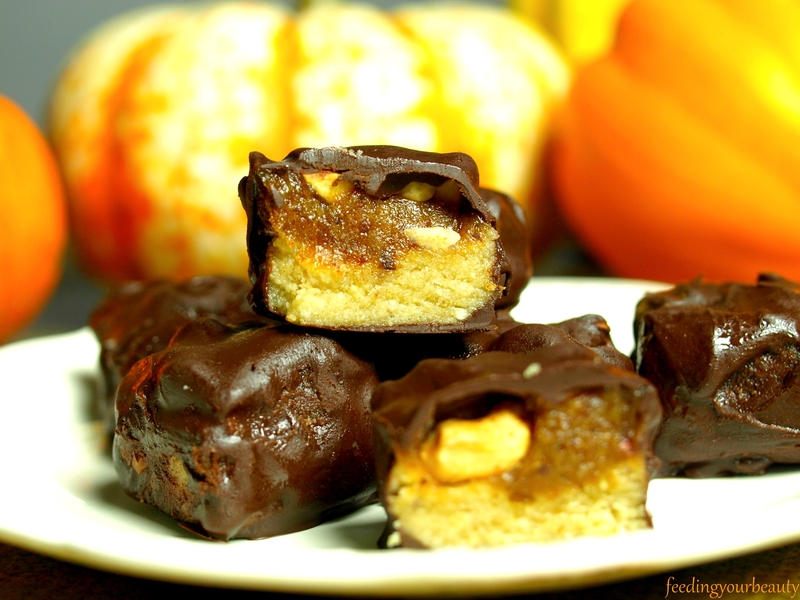 I invite you to make these frightfully simple, scary good candy bars for a spoookily healthy Halloween! Muuuaaahahahahaha! Prepare the healthy caramel in your food processor. Keep it handy. Make the nougat. In a large bowl, mix the cashew flour, 2 Tbsp of the healthy caramel (from above), a dash of salt, and a few drops of vanilla. I ended up using my clean hands to mix it up until all ingredients were incorporated. Add another tablespoon of caramel if it seems too dry. It should stick together easily. Using a teaspoon, scoop a small amount of nougat out of the bowl and press into the silicone ice cube mold. You can adjust amounts depending on the size of your tray. Next, scoop a teaspoon of caramel onto each nougat layer, wet your fingers to make it easier. Finally, add the chopped peanuts to the caramel layer and press down so it sticks. Place the tray in the freezer for about an hour or so, so the fillings firm up. Make your chocolate. In a double boiler, or a small pot inside a medium pot filled partway with water, melt the chocolate and coconut oil. Remove from heat. Take the tray out of the freezer, and pop out the squares, dipping them into the chocolate, turning and swirling them around to coat evenly. Place on the parchment lined pan. Pop back in the freezer to firm up the chocolate for a few minutes, and enjoy! Store in the freezer or refrigerator. To make fully raw snickers, make an easy three ingredient chocolate and use in place of the melted chocolate bar: melt 1/3 cup unrefined virgin coconut oil, and stir in 1/3 cup cacao powder, and 3 tablespoons of coconut nectar or maple syrup. Also, replace the roasted peanuts with raw jungle peanuts (since regular peanuts are almost always roasted) or substitute with raw almonds. What is/was your favorite Halloween candy?? In addition to Snickers, Twix was also a top contender for me. *rubbing eyes* Is this true? Vegan Snickers?! I’m in!! Haha it’s true Shannon! And they are sooo yummy… better than regular Snickers if you ask me!